A battle royale is brewing between the 488 Pista and the 911 GT3 RS, and both will be on display at next month’s Geneva motor show. If you could take either on a trackday, which would it be? And where? Good Lord. That. Thing. Is. Perfect. I like it 100 times better than the regular 488, because it "corrects" a number of body stylings (such as the front bumper) that I found off-putting / objectionable on the regular model. I love it. What a stunner. MARANELLO, Italy — Ferrari's special-edition V8s have a long history of delivering more than the sum of their individual parts. The 360 Challenge Stradale (2003), 430 Scuderia (2007), and 458 Speciale (2013) each leapfrogged the capabilities of their donor cars to cement their notoriety in supercar history. The latest in that lineage is the Ferrari 488 Pista, a hopped-up variant that is the most powerful road-going V8 in Ferrari history. The Pista is so quick that its lap time around the company's own private Fiorano circuit is only 1.8 seconds behind the LaFerrari. With 49 more horsepower pushing around 198 fewer pounds, the $345,300 488 Pista looks, at least on paper, like a no-brainer for deep-pocketed speed fiends. But there are also a slew of tiny changes that alter its persona — 50 percent of the engine components are new — as well as intangible characteristics. The carbon fiber intake manifold, for instance, shaves weight but also features shorter, lower-volume intake runners for better throttle response. The turbocharger's turbines are composed of a new aluminum-titanium alloy that slashes inertia in half, trimming the powerplant's already minimal turbo lag. Titanium connecting rods aid cylinder acceleration. And new robot-welded Inconel exhaust manifolds are 10-percent wider and slightly longer, offering reduced back pressure and a throatier note. Coupled with reduced sound-deadening materials, the pipes are responsible for more engine sound reaching the cabin.Before tackling the famed Fiorano track, I drive the 488 Pista on the street to see what 710 horsepower in a twin-turbo Ferrari feels like, and my first impressions came on thick. Sure, there's the expected interior upgrades of copious Alcantara and carbon fiber, visible aluminum floor plates, and massive carbon paddles borrowed from the 488 Challenge race car. Hold the red steering wheel-mounted engine start button with a press of the big drilled aluminum brake pedal, and the 3.9-liter V8 fires up with a noticeably more bass-heavy thrum than before, the first hint that this is an entirely different beast than the off-the-rack 488. Leave the seven-speed dual-clutch in automatic, and gearshifts happen remarkably smoothly, even in the second-most aggressive "CT Off" mode, which removes traction control but keeps stability control active. In auto mode there's a tendency to upshift early when trundling around town, but lay into the throttle and appropriately responsive downshifts summon the meaty part of the powerband rather quickly, summoning an intense rush of power. The Pista's acceleration is so brutal, violent, and quick that it's difficult to mentally process how much ground you're suddenly covering. The V8's wail escalates as it approaches its 8,000-rpm redline, not with the fearsome shriek of Ferrari's previously naturally aspirated flat-crank V8s but rather with a deep-toned howl, accentuated with the whoosh of the wastegate and the high-pitched whine of the quick-spinning turbochargers. The Pista borrows a system from the Challenge race car that estimates turbine speed and adjust electronic wastegate settings accordingly. Enhanced turbulence of the engine's fuel combustion enables the two turbos to produce more boost and avoid engine knocking. That efficiency meant Ferrari engineers didn't need to resort to larger turbines, which would have also increased lag. The 488 Pista's neck-straining acceleration is now capped off by a revised rev limiter, which is capable of what Ferrari calls a "wall effect." Unlike previous engine management systems, which taper off power near redline and allow a slight overrun followed by a dip in rpms, the new setup maintains constant power as revs approach redline, and continues a level output instead of abruptly dipping power. This enables stable vehicle dynamics at the limit. Contrast that with new shift mapping that in manual mode delivers more torque during gearshifts. Ferrari describes it as "shotgun + overtorque," and the effect is dramatic. Though the dual-clutch is capable of delivering smooth cog swaps in automatic mode, upshifts and downshifts become punctuated by a sharp punch of power. The feeling, while appropriate for the track, is a bit dramatic on the road, which begs the question as to whether it might have been worthwhile to give the option of manually operated shifts without the slam/bam effect. On the flip side: if you've ever been underwhelmed by the silky smooth polish of a dual clutch, you might very well appreciate this characteristic. Development driver Raffaele de Simone, who has likely accumulated more laps around Fiorano than nearly anyone, says the change came at his suggestion, adding that it sometimes felt "boring" to decelerate and downshift without any input from the driveline. For what it's worth, Ferrari says the effect is good for 0.4-second quicker laps around Fiorano, adding a functional element to the emotional effect. Coupled with its sharp turn in, progressive steering feedback, and prodigious grip from the new Michelin Pilot Sport Cup K2 tires, the Pista feels exceptionally flat and nimble on quick switchbacks, dicing back and forth while lurching and retreating when instigated with stunning responsiveness. As fierce as the 488 Pista felt on the road, however, I never took it beyond "Race" mode, which kept the car tidily tucked into its lane despite generous throttle inputs. On the track, however, turning the manettino to "EC Off" revealed an entirely different character to the chassis. The Pista marks Ferrari's first use of brake vectoring while cornering, and the effect eliminates the snapping effect of throttle-instigated oversteer, enabling more manageable drifts when appropriate countersteering measures are used. Lift the throttle and yank the wheel, and you can feel the stability control keeping the car from spinning out; trigger a drift more elegantly and subtly, and the system makes it feel effortless, if a bit disconcerting to trust entirely since the massive reserves of torque make it easy to wag the tail in "EC Off" mode. Experimenting first on a few small corners quickly bolstered my confidence at Fiorano, though it would have taken more than four hot laps for me to find just the right balance of steering and throttle inputs to confidently maintain full corner-to-corner powerslides. Regardless, this system that Ferrari calls the "dynamic enhancer" marks a significant shift in their stability management philosophy, embracing a brake-modulated yaw control system that has long been used by manufacturers like Aston Martin, Lamborghini, McLaren, and Porsche. The setup speaks for itself, since the 488 Pista's Fiorano record is the first time a street car's timing was not recorded with all systems off, but rather in the yaw-controlled "EC Off" mode. The carbon ceramic brakes offer appropriately deep and fade-free stopping characteristics, inviting a more aggressive driving style that's well-suited to the track. Meanwhile, high-speed stability is enhanced through revised aerodynamics that deliver 20-percent more downforce – 529 pounds at 124 miles per hour. As with its hot-rodded predecessors, the 488 Pista manages a quantum leap in performance that transforms it into a remarkably different performance machine. But also significant is the role of technology in achieving those goals: its turbocharged characteristics are so effectively masked that this special variant offers a no-excuses alternative to naturally aspirated engines, while its advances in stability control and introduction of brake vectoring broaden its performance envelope with greater control. Perhaps it's those aspects that evoke a sort of digital quality to the 488 Pista, one that requires driving remarkably high speeds to fully experience its true nature. 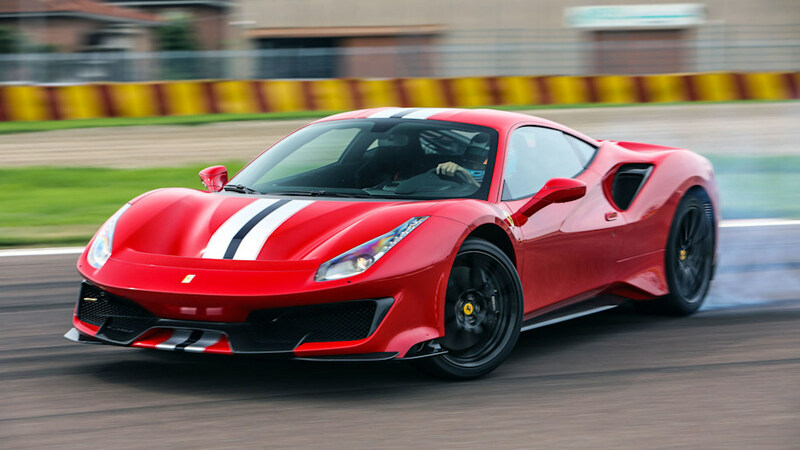 While its awesome power can certainly be experienced on the street, it's a dish best served where the 488 Pista's personality can be fully exploited: on the race track. Got a ride in a 2019 488GTS (owner was a friend of my brother who sold two startups so this is his 2nd Ferrari, other was a California he sold) last weekend while visiting South Beach . Crazy fast, very high material/build quality. Only a short 1/2 mile drive but the acceleration/deceleration and transmission shifts are mind boggling.